"I am feeling in the flesh, and not intellect in the flesh." Vaclav Nijinsky (1889-1950) is one of a handful of dancers that are still household names. This is the case even though his performing career was quite brief, ending abruptly before he was 28. After parting with Sergei Diaghalev and the Ballet Russe in 1917, Nijinsky waited out the First World War in St. Moritz. But while there, he suffered a nervous breakdown, and never danced again. This film by Paul Cox is an interpretation of the diaries or notebooks kept by Nijinsky as therapy during his mental illness. Read by Derek Jacobi, the diaries are undated and frequently incoherent. Cox marries them to a variety of images, including vintage photos of Nijinsky, dancers reinterpreting Nijinsky's greatest dances in costumes evocative of his own, as well as birds, nature, art and other imagery. Derek Jacobi gives a fine performance, as usual, narrating the diaries in Nijinsky's first person, expressing despair, exuberance and every emotion in between. By the very nature of being the diaries of a man in the throes of mental illness, there are difficulties inherent here. We have almost by definition the unreliable narrator, and thus it is difficult to parse how seriously the text itself ought to be taken. Cox seems to be taking the romantic notion that the mentally ill have greater insights, but the results don't very well support that notion. 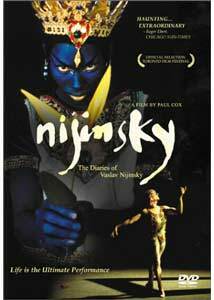 Nijinsky imagines himself to be God, Christ and Buddha, all rolled into one. His entries are frequently filled with outbursts of all-encompassing love for all people and places. This is combined with oddball theories regarding vegetarianism and sexuality that seem to be rooted in Freudian issues of long-standing. Yet Nijinsky also has moments of clarity, particuarly when talking about his art. He acknowledges that he does not represent the intellect by any means (indeed, he attributes Nietzsche's madness, to which he repeatedly returns, to thinking too much), but rather pure physicality. Particularly poignant is the confession that he only attempted to teach dance to one person, his wife Romola (Delia Silvan), and how shattered he was when she was afraid to learn from him. He also acknowledges to a certain extent the futility of his chosen art, in the fact that notating one of his dances took over two months of labor, but the dance itself lasted less than ten minutes. Scattered throughout are ruminations on death, his Polish-Russian heritage and the constantly recurring image of a stork in flight. Music of Bach, Debussy, Rimsky-Korsakov and Bellini is prominently featured, with a recreation of Nijinsky's most famous performance, Debussy's Prelude to the Afternoon of a Faun, forming a centerpiece to the film. Although the viewer is not left with a greater understanding of Nijinsky, the result is certainly a sympathy for him; perhaps that is what he really asks for in these notebooks. Image Transfer Review: The anamorphic widescreen transfer looks excellent, as should be the case with a very recent film. There is occasional aliasing on fast pans, and the video-generated titles are oversaturated, generating video noise, but these are fairly minor complaints. Color is excellent, and detail is very sharp and clear. No compression artifacts were visible. Audio Transfer Review: The audio is nearly as impressive. Many segments have a prominent hiss, apparently attached to the recordings of the music. This hiss is thus intermittent, but not overly distracting. Jacobi's narration is clear and has an excellent immediacy. The music makes surprisingly effective use of the surrounds, on occasion with very startling effects. Extras Review: This release is a little light on extras. There is a noisy theatrical trailer, and a bio with filmography for Cox. Brief bios of Jacobi, Chris Haywood and dancers Vicki Attard and David McAllister are included. Chaptering is decent. An impressionistic look at the great dancer, in the throes of mental illness, given a very nice transfer. Not much for extras, but worth a look for anyone interested in the working of the mind or in the dance.